I think the addiction to Mini Eggs is real for most of us. 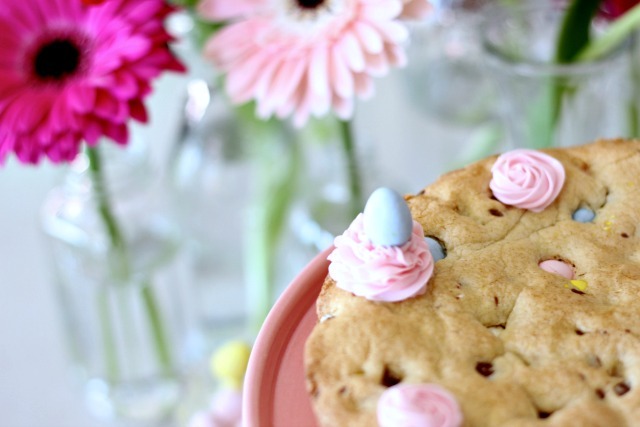 There is something so intoxicating about just the smell of those delicious Easter treats. Crunchy, crispy and chocolatey, and the scent of vanilla magnifying as soon as you open the bag. 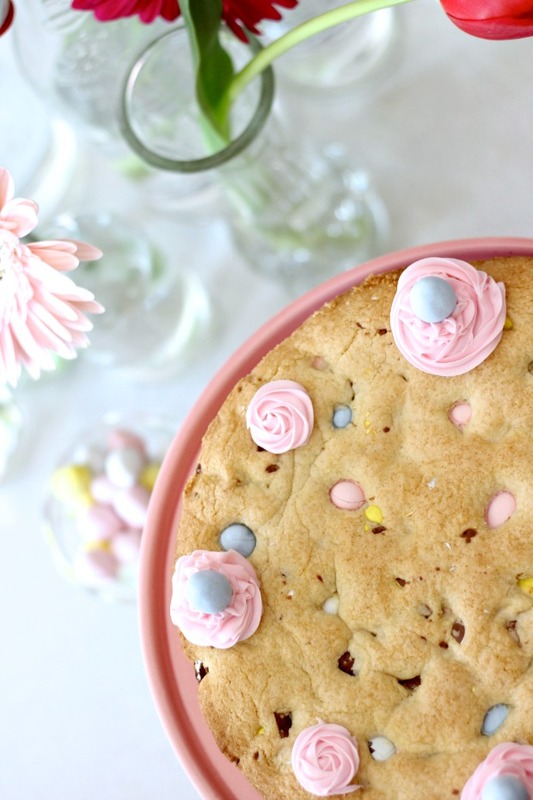 My mouth is watering just thinking about them… I love making a classic Bunny Bark for Easter, but this year I wanted to try something a bit different. 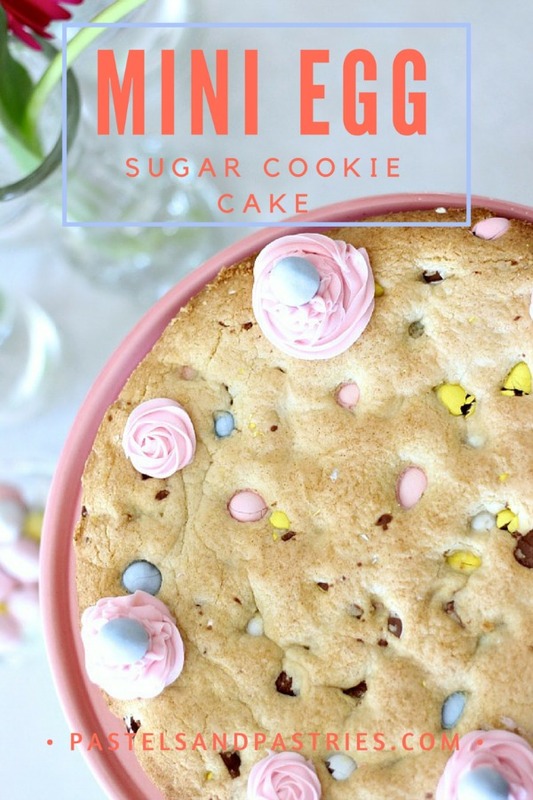 This weekend I went off on limb to adapt Sally's Funfetti Sugar Cookie Cake to resemble something similar to my favourite cookies by Toronto bake shop Desmond and Beatrice. The result? 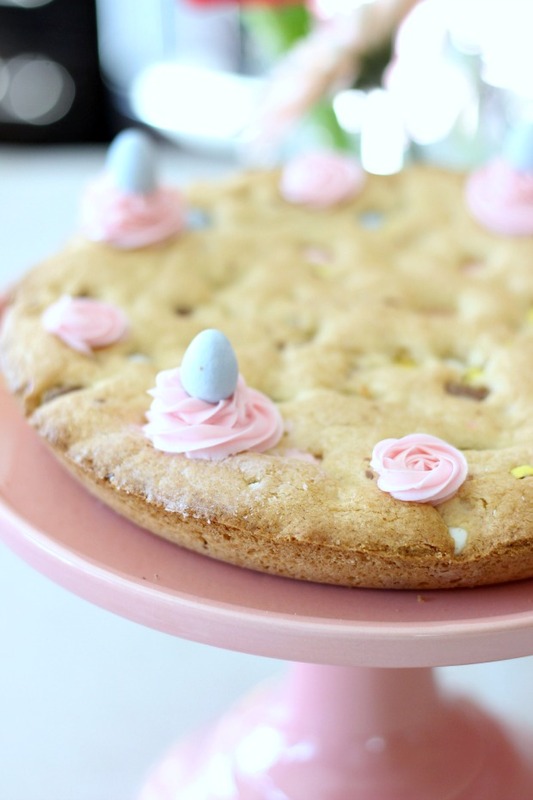 An utterly sweet, chewy, soft baked, pastel dream of a cookie cake. 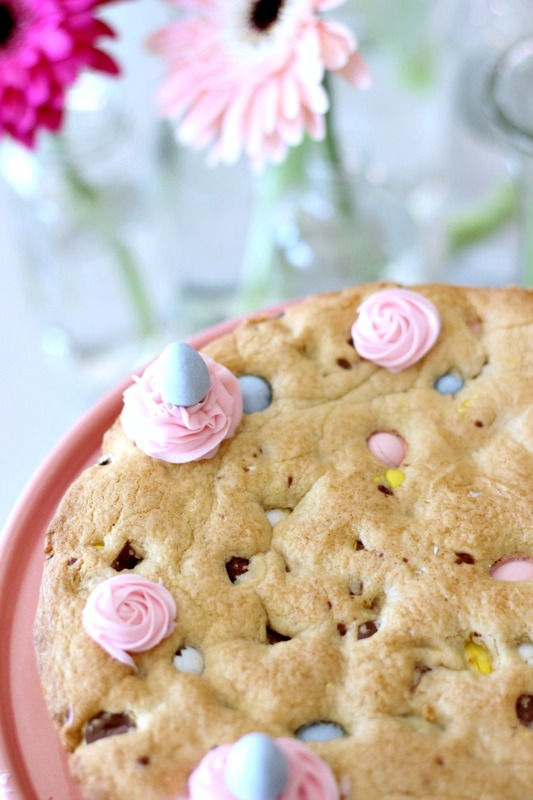 So perfect for any Easter/spring gathering! 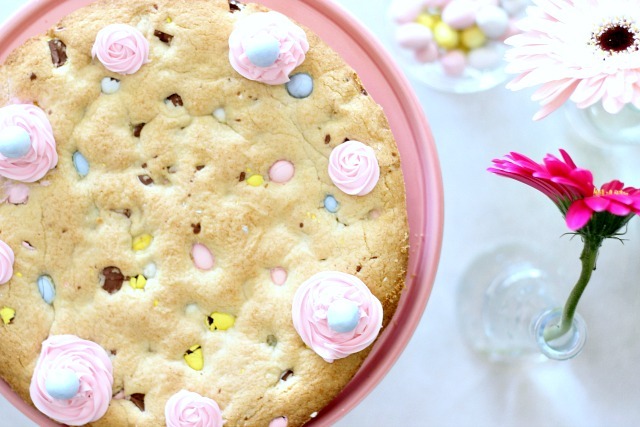 Take stock of Mini Eggs while you can and get in the kitchen to re-create this easy, massive and delicious cookie cake. Preheat oven to 350 degrees F, and spray a 9-inch pie dish with nonstick spray. Set dish aside. Cream the softened butter for 1 minute with a mixer. Once smooth add the sugar until fluffy. Beat in egg, egg yolk, and vanilla until combined. In a separate bowl, whisk together the all-purpose flour, salt, baking powder, baking soda, and cornstarch. Add the flour mixture to the butter mixture in three equal segments until combined. Dough will be thick. Lay mini eggs on wax paper and cut into chunks. 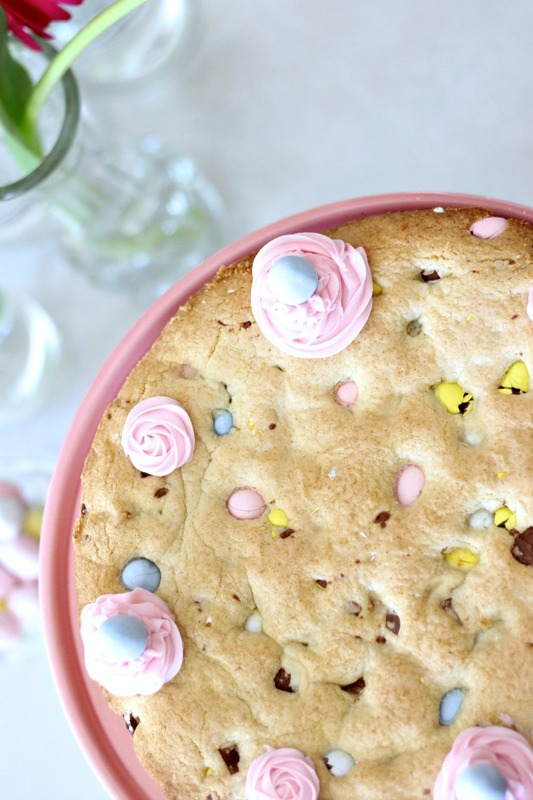 If you can do this in a large tray it will be easiest as the mini eggs tend to fly all over the place! 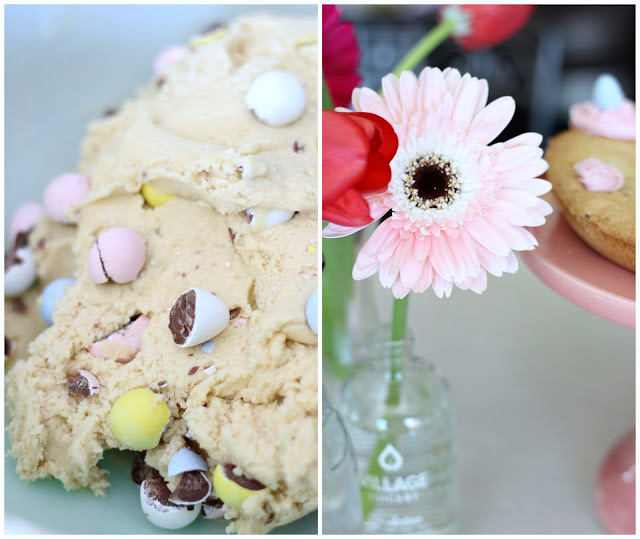 Add mini egg pieces to dough and fold in using spatula. Press the dough evenly into the sprayed pie dish (I added some whole mini eggs to the top of the dough for more colour). Bake for 23-25 minutes or until lightly brown on top. Cool on wire rack before taking cookie out of the dish. 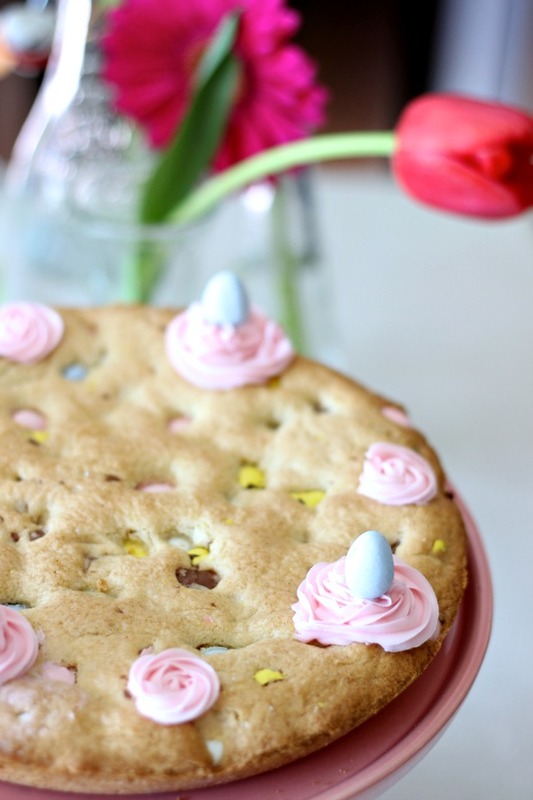 Optional: Use your favourite frosting recipe (this one) to create little flowers/swirls on the top of the cake. Top the larger ones with whole mini eggs. I devoured half the cake! So good!